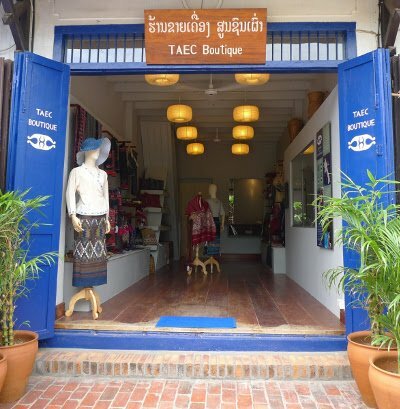 In July, we opened the new TAEC Boutique on the main street in Luang Prabang featuring the Heirloom Collection of one-of-kind textiles and other handicrafts. Each piece is made of the highest quality materials by the most respected artisans of their craft. We hope the Boutique will allow more tourists to support fairly-traded handicrafts from ethnic minority artisans, and discover the cultural diversity of Laos. The TAEC Boutique is open daily from 9am - 9 pm. In addition to reaching more visitors in Luang Prabang, TAEC made new friends and important contacts for future sales by sending Khoun and Alai to the International Folk Art Market in Santa Fe, New Mexico last month. With over 150 artists from 60 countries and 20,000 visitors, this three-day event is the largest folk art market in the world, and we were pleased to participate in it once again.